We are not only offering cheaper AVE tickets Castellón - Valencia, but also your best travel experience. Some of the advantages of travelling by AVE from Castellón to Valencia stand out, such as the speed of travel and the fact of not having to register luggage (nor having to run the risk of loosing it) or the punctuality that characterises high speed. You can travel by AVE from Castellón to Valencia from 15,35 €. Check the timetables for AVE from Castellón to Valencia on, AVE schedules Castellón to Valencia. Other advantages of travelling by AVE from Castellón to Valencia might not be so well-known. Did you know that a journey Castellón - Valencia by bus can be more expensive than getting your tickets for AVE Castellón Valencia? Apart from the lack of comfort while travelling by bus. Inside the AVE, you can stand up, walk, go to the bathroom whenever you need or use the coffee service. And it will leave you at Valencia punctually and without any delay Â¡you can start your visit in Valencia! We present a new way to see AVE tickets Castellón Valencia. Equally, for the return, AVE Valencia Castellón. If we offer you all this comfort and speed, for prices between 15,35 € and 40,15 €, carrying out the operation and the booking of your tickets for AVE Castellón Valencia in an effective way and online. What do you say? This and more is what Trenes.com offers you, because apart from giving you the cheapest tickets for AVE Castellón - Valencia, we give you some suggestions so that you can reduce the price so much as possible in your tickets for AVE Castellón - Valencia on Trenes.com. Trenes.com adapts to all devices, so that at any time and place, you can check the price of your tickets AVE Castellón Valencia and book them in comfort. The search for the AVE train ticket from Castellón to Valencia for the best price was made on the 22/03/2019 a las 12:07 h, it is a AVE train with departure on the 23/03/2019 a las 14:15 h and arrival on the 23/03/2019 a las 15:00 h. The price of the cheapest ticket has been 15,35 € and the cheapest rate possible for this ticket has been the Promo fare. Trenes.com issues official AVE Castellón Valencia tickets and it does totally legally as a verified and authorised travel agency by Renfe, ie if you buy a AVE Castellón Valencia ticket through our website, you only need to print the ticket or to show the bidi code sent to the mobile phone, present it at the Castellón De La Plana station and get on the train you have got assigned. This is a real example of a Castellón Valencia ticket issued by Trenes.com. On it you can see the ticket number 7903800834488, the locator H643K9, the origin and destination stations, in this case the train travels from Castellón De La Plana to Valencia Joaquín Sorolla. The railway operator Renfe, the train type AVE, the train number 05149 and the rail car 005. 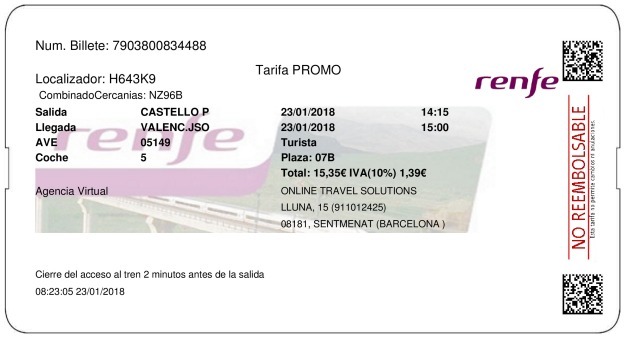 The contracted rate Promo in Turista class, the assigned seat 07B, the price for the ticket, this Castellón Valencia train ticket is not necessarily the cheapest ticket since the price of the train ticket often depends on the time in advance with which you bought the ticket. In this case the price is 15,35€ and the departure date is 23/01/2018. The train departure time of this ticket is at 14:15 h and the arrival of this train at the Valencia Joaquín Sorolla station is at 15:00 h. The duration of the journey from Castellón De La Plana to Valencia Joaquín Sorolla has been 45 minutos. The most appropriate hour for travelling cheap by AVE from Castellón to Valencia is the one at 7:02 h, leaving at this hour, we arrive in Valencia at 7:50 h. At this time, thejourney is of 48 minutes and costs the minimum amount we are able to offer, only 15,35 €. The seats in AVE trains are more spacious than those in the aeroplane, and this is only one of its advantages. In turn, we are going to travel in Turista class instead of doing it in other classes, particularly, we have to avoid Preferente class since it is the one which more raises the price of our tickets AVE Castellón Valencia and when it is time of booking the tickets for AVE Castellón - Valencia we will do it for ida instead of booking tickets for AVE Castellón Valencia of ida. Save from today on your tickets AVE Castellón - Valencia. AVE tickets from Castellón to Valencia that transport us to Valencia in 45 minutes are for the quickest AVE Castellón Valencia to make this route and its price is of 15,35 €. Green light for your tickets AVE Castellón Valencia at incredible prices!